Change can be good, I think. I was sitting on the plane, bored. The film they showed was a Jack Black comedy. I started writing some ideas on a piece of paper. At the hotel I woke up at three in the morning. Since I couldn't fall asleep again I used the notes and wrote a 20 page dialogue scene between the detective in Lost Cat and a woman he meets. It's an important scene that I only had had a general idea about before. Now the words flowed. The first thing I had seen stepping out of the metro station to find my hotel earlier that day was a Lost Cat / Chat Perdu note. Was it a sign? 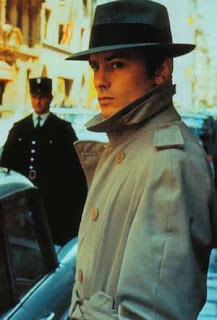 Maybe, except that the French title of the book probably will be Le Détective Triste, The Sad Detective.